On Sunday, October 16th, I toed the line for my 20-mile Long Run -- the last major distance run in preparation for the big event! This is the farthest I have run in my whole life. This was going to be a true test of my readiness, both mentally and physically. Race Day started like any other. I woke up at 3am. I ate my standard pre-race meal. I got dressed and got my gear together. I left for the race around 4:15am and arrived a little after 5am and found an awesome parking space in the garage right across from the start. So far, so good! Since the race did not start until 7am, I put the seat back and tried to relax, rest, and listen to music. I was a little worried about how I would do because of being sick Wednesday-Friday and not really being able to carbo-load or run much that week. So rest seemed like a good plan. Every little bit helps! At 6:15am, it was time to see the race village and warm up a bit. I ran into several Marathon Maniacs and chatted with them. More and more Maniacs and Half Fanatics showed up, which was great. I met Heather who is also a WISHer as well as several really nice folks who ran the Chicago Half last weekend. We all gathered around 6:30am to take a team photo at the Start Line. I was feeling pretty excited by this point (my first HF Team Photo!). Then it was time to get focused. First stop: the porta-potties. On my way there, I ran into my running coach Meghan! What a nice surprise for both of us! We talked for a bit, and I got introduced to her husband who was running the Half Marathon with a friend. After wishing one another Good Luck, I did my porta-potty business and got into my corral. I decided to join a Pace Group for the race in order to keep from starting out too fast, and to keep a relatively steady pace throughout the race. Pace leaders were only going to be available up to 10 miles for me, because the 20-milers break off from the marathoners at the 10.5 mile point. But I figured getting paced for half the race would be helpful. So I picked the 5hr pace team. 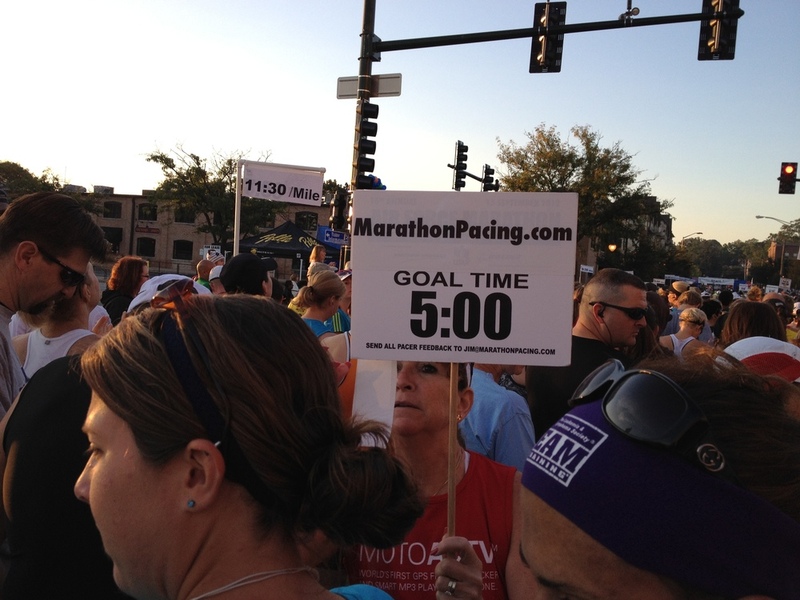 When the race began, it took us 15 minutes before we actually crossed the Start Line. It was about 52F and sunny, and I felt pretty good. The first 5K and 10K went pretty uneventfully. I was fueling well and drinking Gatorade at every water station (our pace leader suggested not skipping any stations). I was running alongside the pace leader, listening to her entertaining stories. She kept our pace between 11:20-11:35 which was fine. I was able to stay focused and get into a rhythm. The course was relatively flat, more sharp turns than I had expected and several short, sometimes steep hills, but all-in-all pretty flat and very scenic. Between Miles 4-5, I saw something that really gave me an energy boost. Courtney, a fellow WISHer, was there with a big sign that had "WISHERS" at the top (I have to admit I don't remember what the whole sign said)! Well, I was just beaming when I saw her and the sign! What a surprise that was! No one comes to see me race, so seeing someone who cheered for 'me' was an amazing feeling. When I separated from the rest of my pacing team, I ran across the bridge and started my trek back towards the Finish Line. At Mile 11, I took a walk break as I approached the water station. I was feeling a bit tired but still strong. I got my music started and I kept running. Things were going good until after Mile 12, when a woman in front of me started slowing down and moving towards the edge of the path. Then she knelt down and vomited! I stopped alongside her to see if she was okay. She wasn't. So I flagged another runner and had them go to the water station to get someone from Medical to help. The woman kept vomiting and was complaining of being dizzy. It looked like she was dehydrated. I waited a few minutes until Medical arrived, at which point she told me I should continue the race. Reluctantly, I did. I figured she was in good hands. But then I had my little setback. I started to run and after several strides, I started having pain on the outside of my right knee. Out of no where! I hadn't had any pain up until that point. I think my muscles/tendons must have tightened up while I was waiting with the woman. I didn't know what to do, so I stopped to see if I could stretch the muscles out. After a bit, I started walking to test the knee. It still hurt but not as badly. So I kept walking until the pain subsided. Then I started running again. I got another boost when I saw Courtney AGAIN! She had moved to the other side of the Fox River to cheer the runners on their return leg. I cannot thank you enough for being there, Courtney! Well the knee held out for another couple of miles and then the pain returned. So at that point, I decided I had to switch to a Walk/Run strategy. That would give the knee time to recover during the walk segments so that I could run for a bit. I did this for the last 5 miles of the race. Since this race was taking the place of a 20-mile Long Slow Run, I was not really worried about my time (you can never go too slow on an LSR). The only thing I did not want to have happen was to have my 5hr Marathon Pace Team catch me before the Finish! At the last mile, I made myself run because no way was I walking any part of that last mile to the Finish. There was no one really around me at that time, so as I ran that last 1/4 mile, there were LOTS of people lining the road and bridge who were cheering me on. That made me smile and gave me the energy to cross that Finish Line at speed. I was never so happy to have someone put a medal around my neck! After the race, I got some water, chips, banana, cookies, etc and headed right for my car. I was tired, my knee hurt, and I just wanted to sit down for five minutes. So I got to the car, got my sandals on, grabbed a towel from the back, and sat down in the comfort of A/C. 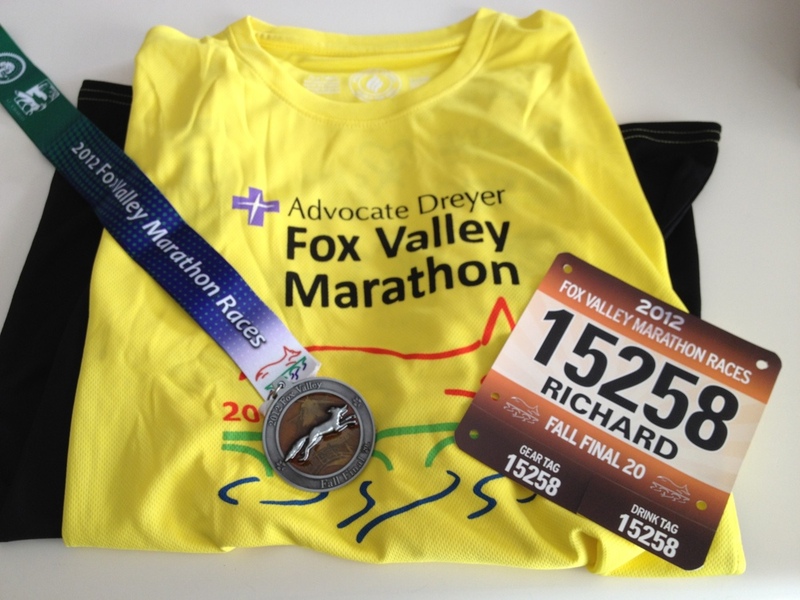 I drank a bottle of Muscle Mike, ate the chips, and just chilled out for a bit as I admired the cool medal. It was a fun race. I think I will do this one next fall (well, maybe the Full rather than the 20-miler). As I look back upon the experience, I did a lot of things right. The pace group was a good idea and I was able to stay with them. My fueling worked well, my hydration was good, and I didn't experience any breathing issues even though we were running through lots of trees and grassy areas (thank God for all the shade trees!). My gear worked well. My feet were sore from the effort but no hot spots and no blisters. The only real issue was my knee which I believe was the result of muscles tightening up. If anything, I should have taken more time to stretch when the pain first hit. My final Finish Time was 4:27:50 but if I deduct the time I spent waiting with the woman, my real Finish Time was 4:26:24 (a 13:09/mm pace). I will take it! Hopefully, I can do better during the Full 26.2 on October 7th. Now it is time to enjoy my taper period, reducing my weekly mileage, and let my body (and knee) heal up before the big event! Posted in 20-M, Training, Marathon Training, Races and tagged with 20-Miles, Training, Races, Marathon Training. September 20, 2012 by Richard Peete.